Pioneers in the industry, we offer renewable briquetting press machine, renewable biomass briquetting plant, renewable briquetting plant and renewable briquetting presses from India. We are making briquettes from agro green waste by setting up renewable briquetting press machine. This machine compresses and binds the raw material from stalks, powder or granular form to solid form by heating the raw material and using high pressure. 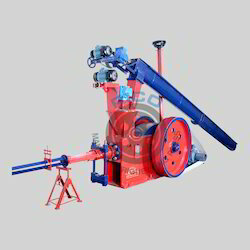 This renewable briquetting press machine does not require any external source for heating or generating pressure. Renewable energy sources are not only good for the environment but if done well, they can pay for themselves and reduce poverty around the world. Renewable biomass briquetting plant is that type of renewable source through us can reduce poverty around the world by generating cost effective bio fuel from agro forestry green waste. This plan t can help us to create Eco friendly surroundings. There are many good reasons for using renewable energy sources and briquetting plant is the renewable source for us. Renewable briquetting plant is cleaner and less polluting than traditional forms of energy such as petrol, diesel, kerosene, lignite and so on. In India and other agricultural based countries, there is large scope of this project due to huge availability of Biomass. Biomass and agriculture ravage can be converting into useful product through renewable briquetting process. Biomass briquetting is the process of converting low bulk density biomass and agriculture feedstock into high density renewable briquettes. It is the renewable and sustainable source of energy through we can make green ambiance.